Check out the travel section of the American Heritage web site for an article I wrote on the public opening of Philip Johnson's Glass House in New Canaan, Connecticut. The article was published today and should be on the front page for a week and then will be available in the archives. I got to tour the property in March and it's an amazing place. The demand for tours has been overwhelming; they are sold out for 2007 and booking into 2008. Sorry it's taken me a couple of weeks to post this, perhaps it was the trauma of the return trip home. We were lucky enough while out in Pittsburgh to go to the third round of the U.S. Open golf tournament at Oakmont Country Club. It was my first time at the U.S. Open, and I wasn't expecting too much in terms of being able to see much action or get close to the players. I was expecting tens of thousands of people and spending the day on tiptoes trying to peer around eight heads in my way to see anything. But I was pleasantly surprised. If you watched on television, you know that Oakmont is split in half by the Pennsylvania Turnpike. We made the conscious decision not to cross over to holes 2-8, the side of the course where the majority of patrons entered. That could have been part of the reason, but even after the leaders passed the eighth hole, it still didn't get crowded on our side of the course. We also decided not to follow Tiger Woods, which is where everyone else may have been. We were able to grab seats in the grandstands and find plenty of spots along the rope lines with good views of the course all day long. Check out the putting green. We were hanging out at the putting green to watch the players practice before they teed off. The added benefit of doing this at Oakmont is that the practice green is also the back half of the ninth green, so we could watch some of the action at the same time. We were right on the rope line until Tiger showed up, about an hour and a half before his round. Quickly the line got about eight people deep. So if you want to see a particular player up close, grab a spot at the putting green 60 to 90 minutes before tee off. Hit the range after the round. The grandstand at the practice range was filled up while players were warming up before their rounds. However, many of the players return to the range after their round for a little more practice. This is a great time to see them up close as the grandstands are pretty empty at that point. Be aware of the prohibitions. There is quite a lengthly list of things you can't bring on the golf course. No cell phones is probably the most important one to keep in mind. The good thing is that there are free phones around the course you can use to arrange for any necessary transportation you may need. No Blackberries either. Be sure to read the prohibitions carefully before heading out. Bring binoculars. It can be tough to see what's going on hundreds of yards away from the green. Binoculars would be a big help. We forgot them, and that was a mistake. We could have used them. Not sure if they will have this next year, too, but bring your American Express card. This year American Express offered cardholders entrance to their tent, which had air conditioning and high-definition televisions. You also got a free drink and snack for you and a guest. Next year, the U.S. Open will be held at Torrey Pines in San Diego. For tickets, go tot the U.S. Open web site. Ticket applications are taken through August 15, 2007. This is definitely one of the world's greatest sporting events to see before you die. One of my favorite things about booking a new vacation is that I get to go out and buy a new travel guidebook. For me, that means a trip to The Globe Corner Bookstores in Cambridge. I'm like a kid in the candy store with all of the books, maps, and globes. I bought my Geochron at The Globe Corner Bookstores, and the staff is excellent. I was lost for a time after they closed their former location in Harvard Square. Luckily, they reopened about a year ago in a new, albeit somewhat smaller space, at 90 Mount Auburn Street. The bookstore also hosts an Adventure Travel Lecture Series with talks by travel authors. If you're not in the Boston area, you can still browse and buy through their web site. Borders and Barnes & Noble are great for their selection, but I prefer going to local businesses than big-box stores. And another thing that these superstores lack is the thrill of the chase (and books for $3 or less) that you get at used book stores. There are a couple of good ones in Boston that I visited last week. The Brattle Book Shop at 9 West Street near Downtown Crossing has a huge selection of used books. It's easy to spend hours just browsing the shelves. There are carts filled with books in the lot next to the shop and a couple of floors with books from the floor to the ceiling inside. There are plenty of books outside that sell for $5, $3, or $1. 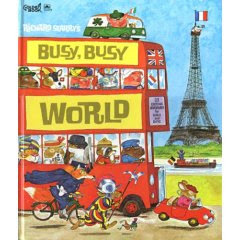 I stumbled across a copy of Richard Scarry's Busy, Busy World, which I loved as a kid, for $5. It's not in great condition, but the book is selling on Amazon for $60 or more. Brattle Book Shop also buys and sells rare books. Commonwealth Books has a number of locations in the Boston area. I browsed the shelves of the location in the basement of the Old South Meeting House on the corner of Milk Street and Washington Street in Downtown Crossing. There are some discount books on the shelves on the sidewalks of Milk Street and the store is down the steps. It's not as big as Brattle Book Shop but still an interesting place to look for a lost gem of a book. If you're an amateur shutterbug and history buff like I am, then Photowalks is a great way to see the sights of Boston. Photowalks provides five different walking tours of Boston: Beacon Hill, Back Bay, Freedom Trail, Public Garden, and the Waterfront. This morning, my guide Saba took me on her Postcards of Boston tour through the Public Garden, probably my favorite place in Boston, and Beacon Hill. In between historical tidbits of various sights in the garden, Saba provided advice on angles, camera settings, framing the subject, and positioning to take better photographs. The garden provides a great setting for a photo tutorial, since there's a diverse range of subjects: statues, flowers, the Swan Boats, the swans, the lagoon. Saba has a great eye for detail and what makes a great shot. Saba mentioned that she gets many Beacon Hill residents on her tour of the neighborhood, and Photowalks provides a unique way for Bostonians to learn more about the places in their backyard. I know I learned a lot of new information. One of my favorite stories was about the "Battle of the Bricks" in Beacon Hill when a group of women staged a sit-in on the brick sidewalks of Beacon Hill to prevent the city from tearing them up and replacing them with concrete sidewalks. I had no idea that the brick sidewalks, which add to the character of the neighborhood, were so close to being lost. I think I got some interesting shots, with Saba's help. We were fortunate to catch the swans around their nest of eggs, which provided a good subject. Also was able to get some good detail shots. This shot of the fountain may be my favorite with the silhouette and the beads of water suspended in air. Here's a link to some of my other photos. If you're a visitor to Boston or a resident, Photowalks can provide a real unique way to see Boston. As an added bonus, you get a small guide to creative photography with more tips as a take-away item. Today is the summer solstice (at least up here in the Northern Hemisphere). In lieu of heading to Stonehenge, I'm celebrating with my Geochron. At least we're free of druids and pagans, here. I think. The solstice is a particularly interesting day to see which areas of the world are receiving the maximum and minimum amount of sunlight. Thank God for the Geochron! Or thank James Kilburg, the Geochron's inventor. The thing I love about the Geochron is that it shows the exact portions of the world that are in daylight and darkness at that very moment. Looking at the Geochron today, you can see how much more sunlight the Northern Hemisphere is getting compared to the Southern Hemisphere. It's nearly midnight in Iceland, and it's still light, and the sun is just rising in other parts of Scandinavia. The sun has set on nearly all of South America, but North America is still bathed in light. The Geochron has another great feature showing the part of the Earth that the sun is directly above. Today, it's directly on the Tropic of Cancer. Unfortunately, for us up north it's now on its journey back toward the Tropic of Capricorn. There have been a number of stories in the news warning about the potential for lengthy flight delays and frustration for air travelers this summer. Well, if our trip to Pittsburgh last weekend is any indication, summer arrived just a little bit early. What an absolute nightmare. Our 7:45 PM direct flight from Boston to Pittsburgh on a Thursday night was delayed by nearly three hours, not due to weather but to traffic delays. One of the problems with the current airline model is that a plane can go to so many areas of the country in one day that it's bound to encounter some poor weather or congestion along the way, creating a snowball effect. That's what happened with our plane, which went up and back to Raleigh-Durham before heading out to Pittsburgh. So we didn't get into Pittsburgh until well after midnight. But that was nothing compared with the flight back. First of all, we were scheduled on a JetBlue direct flight from Pittsburgh to Boston, getting in at 4:07 PM. For some unexplained reason, the direct flight was canceled about six weeks ago and placing us on a connection through Kennedy Airport in New York. Connections are usually not good; connections through JFK are almost never good. So, our 3:35 PM from Pittsburgh to JFK left the gate fine, taxied out, and then we learned we would sit there for 15 minutes because of "traffic" at JFK. When the 15 minutes were up, there was a mechanical problem with the plane, forcing us back to the gate. After the problem was fixed (which, in a consistent pattern was estimated at 15 minutes but was really an hour), we were away from the gate again only to sit again on the taxiway because of, you guessed it, "traffic." We didn't take off to 6 PM and landed at JFK at 7. Somehow our flight to Boston left on time, leaving us stranded at JFK until 10:50 PM. So at 10:50 PM, there would be no traffic at least. Uh, right? Not exactly. After that plane backed away from the gate, we learned that due to international traffic, we were 25th in line for takeoff. We didn't get into Boston until after 12:30 AM. Got home after 1 AM, nearly 12 hours after leaving for the airport. Please keep in mind the drive to Pittsburgh is probably about 10 hours. So, what are the lessons learned here? Always check flight schedules for leaving for the airport. That saved me a few unproductive hours on our flight out. Oddly enough, this story recommends getting to the airport hours early to cope with long security lines. The security lines were actually not a problem for us, and not going too early saved us from being stranded at the airport for hours on end. Avoid connections, particularly through New York. JFK and LaGuardia seemed to be the worst for "traffic." Fly early in the day if you can. That way problems early in the day won't snowball into major delays. Plus, it avoids getting into places after midnight when your transportation options to and from the airport are limited. If it's less then 6 hours (and maybe 10) to drive, drive. Enough said.